Energy storage has the potential to transform the way electricity is generated and consumed throughout the region. When the electric grid supply chain is compared to other daily essential supply chains like water, food, or oil and gas, it becomes evident that electricity currently has the least amount of storage capacity compared to those others. This is slowly starting to change as states begin to explore energy storage potential. This figure from Greentech Media Research shows the growth potential. Energy storage can refer to various technologies including batteries, thermal storage, flywheels, and pumped hydroelectric storage. With many states increasing renewable energy deployment levels, energy storage systems like batteries are becoming much more advanced for the storage of energy from solar PV or wind. States recognize this potential and are taking initiative to enact legislation relating to energy storage. States are in different stages of deploying energy storage; some are commissioning studies to understand the potential, whereas others have taken this step and are now setting up energy storage targets to help create momentum increasing the number of projects. States that are ahead of the game include Massachusetts and New York. In 2016, the State of Charge: Massachusetts Energy Storage Imitative Study was published and provided the opportunity for the Department of Energy Resources (DOER) to set an energy storage target based on the study’s results. As a result, the Baker-Polito Administration has set a 200 MWh energy storage target to be met by January 1, 2020. This is a voluntary target. DOER is also considering increasing funding for storage by $10 million and expanding energy storage in the Alternative Portfolio Standard. 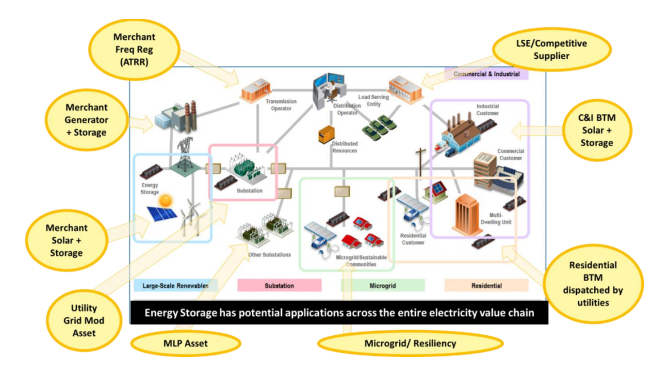 The study suggested that the inclusion of a broader range of energy storage systems in the APS would help monetize the system benefits and help close the revenue gap for developers. In New York, bill A.6571/S.5190 made its way through the legislature. This bill establishes the energy storage deployment program, and directs the Public Service Commission to set 2030 targets for energy storage. The energy storage target will be set by January 1, 2018, with the deployment program also launching in 2018. Another bill relating to energy storage that passed both houses is A.260/S.2049, which establishes a property tax exemption for energy storage systems as well as micro-hydro, fuel cell, and micro-combined heat and power systems. This exemption is currently available under existing law to solar, wind, and farm waste energy systems. By extending the exemption to these other technologies, the law will encourage their installation. Maryland House bill 773 was signed by the governor in early May 2017 and became effective July 1, 2017. The bill directs the Power Plant Research Program to conduct a study to determine what regulatory reforms and market incentives are necessary or beneficial to increase energy storage deployment in the state in a way that is fair and open to all stakeholders. Maryland is taking similar steps to how Massachusetts started its energy storage initiative. It will be interesting to see what developments come from this study. Senate bill 52 passed in Vermont on May 5, 2017 and was signed by the governor on May 30. This bill requires the Commissioner of Public Service to submit a report relating to fostering energy storage on the Vermont electric system and authorizes the Clean Energy Development Fund to fund energy storage projects that support renewable resources. This report is due November 15, 2017. In addition, in Connecticut, Governor’s House bill 7036 was signed into law and became effective July 1, 2017. This writes into Public Act 17-144 authority of the Department of Energy and Environmental Protection for energy storage project solicitation. Under certain conditions, this bill allows electric distribution companies to build, own, and operate new fuel cell generation; enter into power purchase agreements (PPAs) negotiated to build, own, and operate new fuel cell generation; and provide financial incentives to install fuel cell-powered combined heat and power systems. The total nameplate capacity rating of these fuel cell projects cannot exceed 10 megawatts in aggregate. Pennsylvania House Bill 1412 was introduced May 19. This is an act amending Title 66 (Public Utilities) of the Pennsylvania Consolidated Statutes. The bill would restructure the electric utility industry in Pennsylvania by providing for microgrid and energy storage. If passed, a pilot program will be authorized allowing utilities to earn a rate of return on the cost of constructing a microgrid, and also allow for wholesale market participation with net proceeds from participation credited to customers. In determining whether a pilot program is in the public interest, the commission will consider the potential of the program to facilitate the use of diverse electric supply options in the state, including distributed energy resources, as well as the ability to enhance electric distribution, resiliency and operational flexibility. As we can see, there is a lot happening across the region in energy storage legislation. Energy storage provides the flexibility necessary for the electric grid to meet continuously changing needs of consumers. Storage resources can be sized at any level from transmission to individual consumer. The “plug and play’ concept makes it easy to locate near existing power plants, substations, or a consumer’s home. There are a ton of options when it comes to energy storage and it is great to see states exploring this.